You know the old joke, is that a salami in your pocket or are you happy to see me? Well if you’re asking my husband, that’d be an entire freakin salami in his khaki cargo pants pocket weighing him down. There’s also probably a brick of hard cheese in there, too. “I could die right now and it’d be fine, just fine,” moaned The Husband as he made love to a pound of Italian deli meat. We were in our hotel room. Sitting in the dark. It was still light outside. As you most of you SHOULD already know, I got to go on the dreaded gondola ride, so The Husband got to take me on a day long search in Cannaregio for the perfect loaf of crusty bread, as well as salami, prosciutto, ham, and Parmesan cheese. He had a blast on the quest. Me, I got blisters. Normally, I wouldn’t take a bite. I’m not a big deli meat sandwich kind of person. But this was Italy, and the man I married had a look of pure ecstasy on his face, so I took a bite. A small bite. And surprisingly I immediately wished I hadn’t taken such a small bite. The ham was simply amazing. Like butter, it melted in my mouth. I’d never tasted anything like it before in my life. I mean I couldn’t even believe it was ham. Ham! That could taste so damn good. “Oh I don’t think so,” said The Husband, leaning over the table and hording his precious deli items. I grabbed the ham anyway, along with the rest of the deli meat, and joined my husband in a deli meat feast. God it was good. Better than good. Great! Words can not describe. Which brings me to travel tip #2. If you’re ever traveling and find yourself low on funds, do what flight attendants do and visit the local grocery store. Not only will you save a little cash, you’ll also experience the local cuisine. And if, by chance, you ever find yourself at a local grocery store in Italy, thank whatever god you pray to, and then head straight to the back of the store, grabbing a loaf of crusty bread and block of Parmesan cheese along the way. Look for the deli counter, and when you find it, just go crazy. It doesn’t matter what you order. Just order it! And order a lot of it. Trust me when I tell you you won’t regret it. 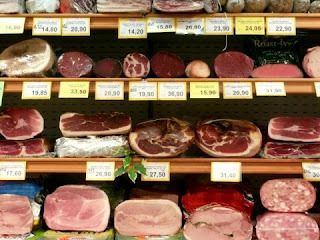 DoctorDude says that the Italians excel in salted pork products and fungi. We are on the fence as to coffee products and ice cream – I’m a Francophile and he thinks the Italian versions are better.